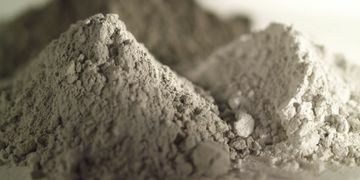 Cement is one of the ancient raw materials used in construction. It is uncertain where it was first discovered that a combination of hydrated non-hydraulic lime and a Poznan produces a hydraulic mixture (e.g., Portland cement) harden because of hydration chemical reactions that occur independently of the mixture’s water content; they can harden even underwater or when constantly exposed to wet weather. Cement is essentially a binder that binds other materials together, Modern cements are manufactured by a chemical process. Raw materials are crushed, ground and blended before being heated in a rotary kiln until they combine chemically. The clinker from the kiln is then ground with gypsum to form Portland cement. fume, retarders, water proffers, coloring agents and other additives used in the mix. It is essential to test the physical and chemical parameters of each cement batch produced and to identify the unique characteristics of each composition. Such parameters include specific surface and gravity of cement particles, consistency, soundness, setting time, heat of hydration, inorganic chemical analysis, loss on ignition, air content and strength.